Embedded Data Systems’ 1-Wire Sensor line includes various temperature, humidity, barometric pressure, and light sensor combinations. Our sensors come in an assortment of form factors, and the entire sensor line supports the concept of user defined alarm detection and notification. If necessary, we can even customize our sensors to meet your exact needs. A brief overview of key 1-Wire Temperature sensor specifications. OW-ENV-T - This wall mount 1-Wire Temperature sensor provides a clean wire free appearance ideal for use in both commercial and residential locations. Its well ventilated design allows for the readings to be both accurate (±0.5°C) and responsive. The installation of the wall mount temperature sensor is also simplified by providing a pass-through screw down terminal which allows easy branching to the next sensor and the VDD auto-configuration feature. OW-RTD4W - The RTD interface enables you to read a 4-Wire RTD through a 1-Wire network. RTDs may be selected to achieve even greater temperature accuracy and/or extend the temperature range. The OW-RTD4W is an ideal tool for monitoring ultra-low freezers. OW-TEMP-B3-12xA - This waterproof 1-Wire temperature probe is designed to offer exceptional performancedurability. The unit is extremely responsive as the DS18B20 sensor is thermally bonded to its protective 3” stainless steel probe. The TPE cable used is very pliable and provides excellent resistance to the elements. This sensor also has the auto configuration feature which helps simplify installation. OW-TEMP-S3-12x - This waterproof 1-Wire temperature probe is similar to the OW-TEMP-B3-12xA, and offers a thermally bonded DS18S20 sensor encased in the same 3” stainless steel probe and pliable TPE cable. However because it lacks the auto configuration feature, this sensor should only be preferred when the existing hardware or software only supports the DS18S20 sensor. OW-TEMP-xF-12x - The Foil Tape Temperature Sensor is an adhesive backed sensor designed to adhere directly to pipes and other smooth surfaces. During installation the adhesive tape covering is peeled off and then the sensor is applied smoothly to the surface to be monitored. 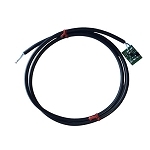 The Foil Tape Temperature Sensor is available in both DS18B20 and DS18S20 variations. The DS18B20 version should be preferred unless the existing hardware or software only supports the DS18S20 sensor. A brief overview of key 1-Wire Humidity sensor specifications. *	Please note the “R” signifies the Option Relay was selected. OW-ENV-TH - The 1-Wire Humidity Sensor provides very accurate Humidity (±3%RH) and Temperature (±0.5°C) readings. 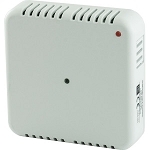 This humidity sensor also features conditional search support, an LED, and optional relay. It provides a clean wire free appearance which looks at home, in both commercial and residential locations. Furthermore, the 1-Wire network installation is simplified by its pass-through screw down terminal which allows the 1-Wire network to be easily extended to the next sensor. OW-ENV-THPL - This 1-Wire Humidity Sensor has all the features of the OW-ENV-TH, but it also offers the ability to monitor Barometric Pressure (±3 hPa) and Light in addition to Temperature and Humidity. A brief overview of key 1-Wire Pressure sensor specifications. OW-ENV-TP - The 1-Wire Pressure Sensor provides very accurate Pressure (±3 hPa) and Temperature (±0.5°C) readings. This pressure sensor also features conditional search support, an LED, and optional relay. It provides a clean wire free appearance which looks at home, in both commercial and residential locations. Furthermore, the 1-Wire network installation is simplified by its pass-through screw down terminal which allows the 1-Wire network to be easily extended to the next sensor. OW-ENV-THPL - The 1-Wire Temperature, Humidity, Light & Pressure sensor provides a means to monitor many environmental factors in one form factor. Additional features include conditional search support, LED, and optional relay. The LED and relay may be controlled independently or in response to user selected alarm thresholds for greater flexibility. A brief outline of the product specifications. Please refer to the data sheet for additional specifications. DS1822Z - Econo 1-Wire Digital Thermometer on Cut Tape. This 150 mil 8-pin SO low cost temperature sensor provides user programmable 9- to 12-bit resolution (0.5°C to 0.0625°C) temperature readings from -55°C to 125°C with an accuracy of ±2.0°C over the range of –10°C to +85°C. DS18B20+ - 1-Wire Digital Thermometer with user-programmable resolution. The temperature sensor provides a very accurate reading (±0.5°C) at a very affordable price. These temperature sensors are provided at the chip level allowing you to design an enclosure specific to your needs, or you can just solder Data, Ground, VDD to the end of the wire and enjoy the faster thermal response. DS18S20+ - 1-Wire Digital Thermometer provides 9 bit resolution (0.5°C) temperature readings from -55°C to 125°C with an accuracy of ±0.5°C over much of the temperature range. This unit is provided at a chip level, see our 1-Wire Temperature Sensors Section on the left to see finished sensors. DS18S20/T&R - 1-Wire Digital Thermometer on Cut Tape provides 9 bit resolution (0.5°C) temperature readings from -55°C to 125°C with an accuracy of ±0.5°C over much of the temperature range. This unit is provided at a chip level. A brief overview of key 1-Wire light sensor specifications. D2Photo - 1-Wire Light Monitor which provides a simple On or Off reading for a light’s current state. This enables the state of many light fixtures throughout a facility to be tracked at an economical price. OW-ENV-TL - 1-Wire Light Sensor which provides a reading of the light intensity in Lux along with Temperature (±0.5°C) readings. This light sensor also features conditional search support, an LED, and optional relay. It provides a clean wire free appearance which looks at home, in both commercial and residential locations. Furthermore, the 1-Wire network installation is simplified by its pass-through screw down terminal which allows the 1-Wire network to be easily extended to the next sensor. OW-VIB - 1-Wire Vibration Sensor provides a means to monitor equipment performance by detecting changes in the motion of equipment. This enables issues to be proactively addressed therefore avoiding costly downtime and other expenses.